Because we do them at a senior residence, our recitals are not only a celebration, but also a chance to give back to the community. The focus comes off self-consciousness, and shines instead on what we can offer to others. 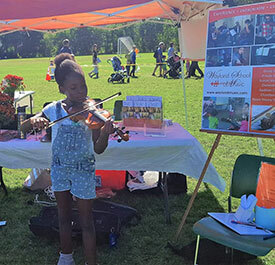 "My 9-year-old daughter loves playing the violin, but was extremely anxious about performing in public. Penny re-framed the recital as a celebration and an opportunity to bring joy to others. She chose an appropriate piece of music, provided a clear plan for practice and explained how the event would unfold. As a result, our daughter mastered the piece, knew just what was expected and performed with ease, to her own surprise and delight." "Thanks for talking to J___ about the recital. It's the first time he's not on edge about performing. It makes a difference to him to understand that he has a purpose there to provide something others will value." Who plays in our recitals? Anyone and everyone! Even a new beginner who has only had 4-6 weeks of lessons can play a very simple duet with a teacher, and will be resoundingly applauded. Our students get used to playing for others right from the start, not just in recitals, but also in “home concerts” for Mom and Dad - or even for an audience of stuffed animals! So the recital becomes “just another opportunity to play”, and no longer such an unknown quantity. We would never force anyone to play who truly does not feel ready, but we do feel that becoming comfortable with performing in a supportive environment is one of the strengths of our program -- and a valuable skill that transfers to other situations too. In the lessons leading up to recitals, we help our students to look for the positives in their practice performances. We give them ideas to help re-frame any anxiety they may be feeling. And we remind them constantly that the goal here is NOT perfection — even their teachers make mistakes! — but communication, and sharing their music with an open heart to bring beauty and joy to others. This all becomes very real as we gather in our recital venue: the beautiful Great Room at Traditions, the senior residence in Wayland Center. As the music starts, the students see the joy their playing brings not just to their own families, but also to the elderly residents, whose faces light up and glow as they enjoy these lovely young people and their music. We are very grateful to the residents and staff at Traditions for granting our students the opportunity to discover that their music can bring joy and touch people's hearts! For parents and teachers, it’s truly wonderful to witness the growth of these students year by year in these performances. Over time we watch the beginners turn into confident and accomplished young musicians, and then into advanced students whose performances turn the younger ones starry-eyed with admiration. The spark of inspiration and service is passed on, and the cycle continues -- truly something to celebrate. * "A couple of days ago, I visited an elderly center with some of my friends to perform some choir, A Capella, band, and solo songs. I was a little nervous at first, but I adjusted pretty quickly. I came to play my violin and also to sing. I had a pretty complicated solo, but I had practiced it a lot and I really felt prepared. Our group decided that it would be nice to walk around and introduce ourselves to the residents. As I walked around, I shook hands with them and told them how kind it was of them to have us come. One man wouldn’t let go of my hand. He was shaking, and when I looked in his eyes, he started to cry. I asked him if he was okay, and he said “You are an amazing, beautiful, girl. I feel so blessed to have you standing here right now.” It was so touching that it made me tear up. It also gave me plenty of courage for performing. He always cheered the loudest and he seemed so proud. Whenever I looked over, he was smiling back at me. I wanted to share this story with everybody that is feeling nervous about performing. I want you to know that you are not doing this to be judged. The point of this recital is to show your talent, yet at the same time you are making many people’s lives brighter."